I have a couple of projects that I have completed in the last few days but haven't had a chance to post to my blog. I find that I spend less and less time on my blog these days. It seems everyone has gone to Facebook and Instagram to share their projects, myself included. It's so much faster and easier to share on those platforms. How do you feel about blog posts and blog visits these days? Too much time and trouble involved or do you still enjoy your blog time? Some days I think I'm ready to give up my blog completely, but I'm pretty sure I would end up regretting it. So I guess I'll continue on for now and just see how the trends continue. In the meantime, I truly appreciate your visits and your sweet comments - they mean so much to me! 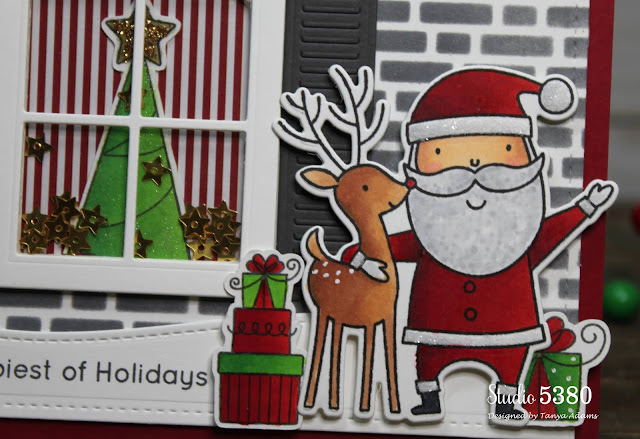 This adorable Santa is from the "Santa & Friends" stamp set by My Favorite Things. I colored him up with my Copic Markers and added a little glitter to his suit for some holiday sparkle. My background was created with the "English Brick Wall" stencil from MFT. Isn't that deer the sweetest? 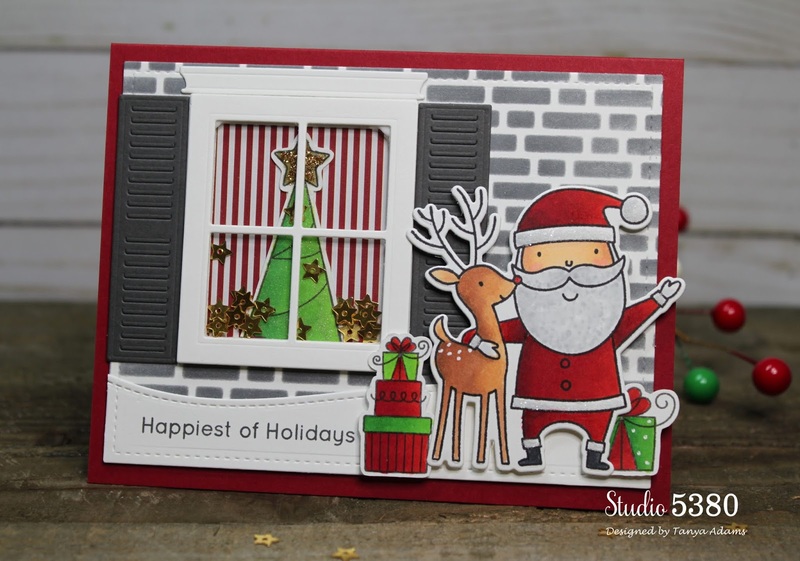 To turn my card into a shaker, I used the MFT die set, "Classic Window". 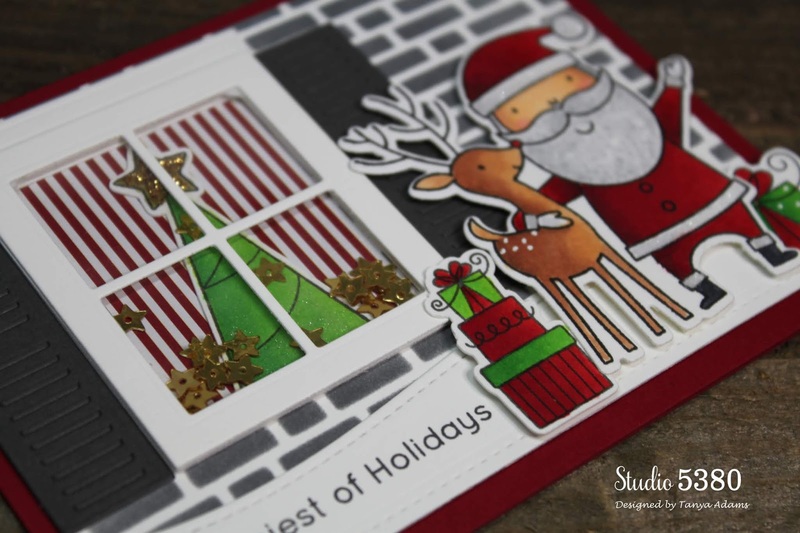 I added a Christmas tree and some gold star shaped sequins behind the window. Again...thank you so much for dropping in for a visit. Have a wonderful day and I hope to see you again very soon. I do still enjoy going to all my crafty friends blogs and taking a good look at their projects and of course leave them some love. Thank you so much for your sweet words, Theresa! I can always count on you for encouraging words! I do enjoy my bloggy visits, but just never seem to have enough time to make the rounds. And, I would love to be on another Design Team one day. So, I guess I'll hang on to my blog for now and try to keep up with posts and visits. I know I would miss it if I gave it up!